American Express reported earnings this week that were largely a mixed bag. Shareholders must now figure out what's next for the troubled credit card giant. Image source: American Express Company. This won't exactly be a newsflash to investors paying even half-attention, but the American Express Company (NYSE:AXP) has struggled mightily the past two years. In January 2015, the stock traded as high as $94. Two years later and the stock price cannot sniff $80, much less its former highs. True, it is well off its lows from last year, but it might be quite a while before it regains its former heights. Last week American Express reported its quarterly earnings, giving investors another chance to evaluate how the company was faring since losing its huge co-brand relationships with Costco Wholesale Corporation and JetBlue Airways Corporation last year. Losing these deals has directly led to the company's struggles. What remains to be seen is whether there are signs of life beneath the rubble, or if it's better to leave the company for dead. The numbers themselves were a mixed bag, giving both bulls and bears opportunities to make their cases. Revenue came in at $8.02 billion, an approximate 4% decline from last year's fourth quarter. On a GAAP basis, earnings per share were $0.88, a decline of only 1% year over year (but note that adjusted EPS was down more than 25% to $0.91). The quarterly earnings press release and presentation seemingly provided two sides of a coin for every metric. When Costco's loss is filtered out, the company looks fairly healthy. With the loss was factored back in, the numbers portray a company still struggling to regain its footing. Just a couple of examples from the earnings presentation clearly illustrate this point. Before revenue is adjusted for the loss of Costco co-brand card members, American Express's revenue declined about 3% (when still adjusted for other factors like foreign exchange rates). Once revenue is adjusted for the Costco losses, though, it increased about 6% year over year. Image source: American Express 2016 Q4 Earnings Presentation. Worldwide billing growth paints a similar picture. Before adjusting for the Costco loss, billing growth decreased about 3%. After adjustment, billing growth increased a healthy 7%. Loan loss provisions, another metric investors will want to watch in the quarters ahead, rose to $625 million, a 9% increase year over year. 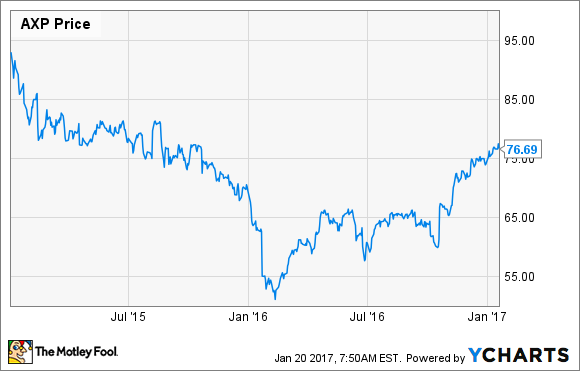 What's ahead for American Express? Card Member spending (adjusted for Costco and the impact of foreign exchange rates) grew 7 percent in the fourth quarter. That increase reflects continued strength in our international markets, accelerated growth among small and mid-sized companies and strong long-term relationships with higher spending consumers. We continued to grow our lending portfolio faster than the market while maintaining industry-leading credit metrics. We acquired over 10 million new cards globally last year, and we added more than a million new merchants to our network in the United States alone. Despite a natural reluctance to accept any company's word on a matter as gospel, this might be the better way to view the company going forward. American Express suffered a well-deserved price decline and valuation compression over the past two years largely due to two huge co-brand customer losses. But that is in the past, and the piper has been paid. What investors must do now is determine if the company has a better future. While marketing expenses have risen to draw more customers, the results show that these efforts might be working. Chenault guided for 2017 EPS to be between $5.60 and $5.80. Taking the low end of that guidance gives American Express a forward P/E ratio of 13.7, about where it trades today. While that's not entirely unreasonable, it should be noted that a year from now, the horrible year-over-year comparisons will be over, and the company entered 2015 with a P/E ratio near 17. Will the company's P/E expand to once again reflect this higher valuation? It might be too early to tell. To be sure, there are some encouraging signs that the business is recovering from its devastating co-brand losses last year. For now, shareholders need to continue watching American Express's adjusted numbers in the quarters ahead. At the very least, adjusted revenue and billing growth must grow for the company to have any chance to meaningfully drive shareholder wealth going forward. The company must also show it won't continue to be out-flanked by more nimble rivals. After all, the Costco co-brand deal was lost to Visa Inc, and the JetBlue co-brand deal was lost to Mastercard Inc. If the company can do these two things, long-term shareholders will undoubtedly be rewarded. The problem, of course, is that these conditions are far from guaranteed.